6:00 - General PTA Mtg. Hope everyone had a great first day of school! Thanks to the Staff Apreciation committee for a warm chalk art welecome. First day for Kindergartners is August 14th. Don't forget to join the Hospitality Committee for the Boo Hoo & Yahoo Coffee on August 14th at 8:10 a.m. in the cafeteria. The ice cream social was a great success! Thank you to Culver's for the yummy ice cream, Chad Beaver and Brooke Latas for on-site help and most importantly Becky Croker for the event coordination. Fall Fest is Friday, September 7th. 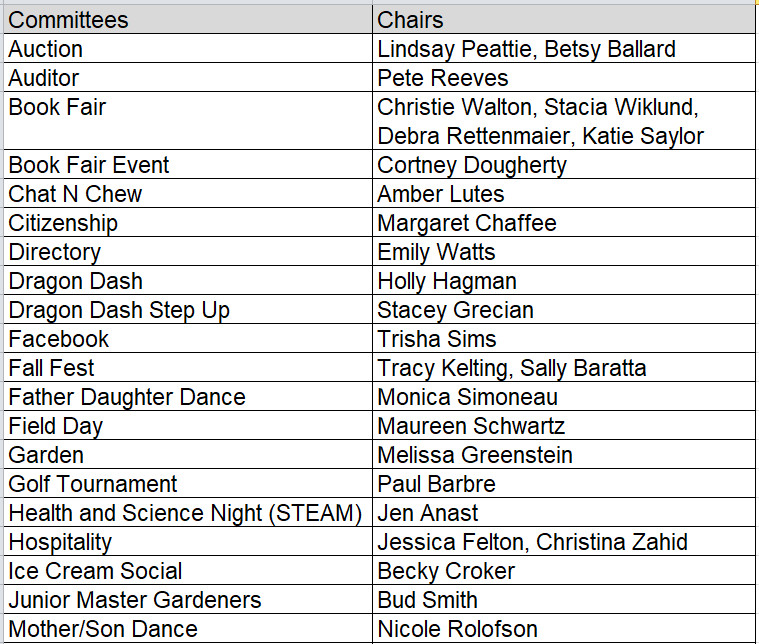 The committee is looking for volunteers to make the event a success. Without volunteers the games and rides won't be available Please consider volunteering your time! More information about the event is below. Sprit Wear orders are due Friday, August 17th. Order information is below. Don't miss out!! Also, don't forget to pay your PTA Membership dues to get access to the online Corinth directory. Order your Spirit Wear now! Please use the attached corrected flyer to order Spirit wear. An incorrect date was published, and to receive gear prior to spirit week and Fall Fest, all order must be placed BY AUGUST 17th. Checks and order forms can be sent via backpack mail. (Orders after that date will not make Fall Fest). Let's get ready to send our kids off to school! Please join the Hospitality Committee for Boo Hoo & Yahoo Coffee on August 14th at 8:10 a.m. Meet in the cafeteria and mingle with old friends or make new ones! Younger Kids welcome anytime! We are so excited for this year’s Fall Fest! What a fun way to kick off the school year with one of the most fun evenings of the year! Just a quick reminder this is a parent run event. Without volunteers the games and rides will not be available. As in years past, each family attending the fall fest is expected to volunteer one shift to make this huge annual event a continued success. Luckily that leaves plenty of time to enjoy the night with your family! This year we are unable to rely on youth volunteers as heavily as we have in past years so we desperately need adult volunteers. Please take a moment to visit the signup genius and volunteer for one shift, or email our volunteer coordinators and they will happily get you signed up. Without your help this event will not be a continued success! A donation of $125 per child is suggested. Donations of all sizes are sincerely appreciated! Watch for an Invitation & Donation Envelope two weeks prior to the party. Checks should be made out to Corinth PTA. These are casual, adult only events to reconnect with old friends, and to meet new ones! Many thanks to this year’s party hosts! It's an auction year! Did you know that the Corinth Auction is our school's primary fundraiser? The funds raised by this event help cover educational programs that are not funded by state or district budgets. This year's event will help fund a part-time school counselor - which we have not had in our building in over five years. It will also continue to help fund our math aide, Maker Space, and other services that help our staff continue to provide educational excellence for our children. Do you own or work for a company that would be interested in advertising to the Corinth community throughout the year? Check out our corporate sponsorship levels here and get in contact with Sheila Weaver to learn more. New this year, there is an opportunity to sponsor BOTH the auction and Dragon Dash at one time....don't limit your promotion - have it run all year through! Do you have connections to get items that would make great items to bid on or do you want to help us gather items to bid on the night of the auction? Get in touch with our donations committee to see how you can get involved. 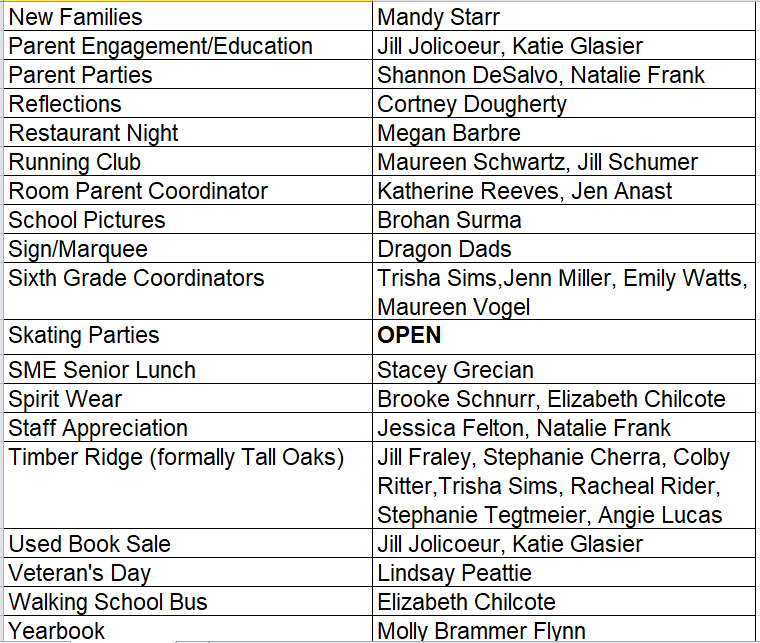 Be on the lookout for information on the upcoming parent parties and how you can start contributing to the auction the evening of your party!! Finally, make sure you are a member of the Corinth Auction Facebook page to get all of the updates and of course, mark your calendar and plan to join us on Saturday, March 2 at Milburn Country Club for a great evening with friends raising funds to support Corinth! We're still looking to fill two chair positions. We need a volunteer to coordinate the Skating Parties as well as a chair for the Talent Show. If interested, please contact Leanne Beezley. If we don't find chairs soon, these events may not be able to happen. Please help out if you can!! Special drinks and snack during Parent Teacher Conferences and special busy days!